All of these projects rely on a set of cutting tools that are very specific to the task at hand. You'll need to either make the tools or purchase them. You'll find that purchasing them can get you started, but as you take on additional projects, you'll end up having to make them. Crown Tools out of the UK offer a set of cutters designed by David Springett. The set comes with 4 cutters, a hole cutting tool and a single handle to use with the 4 cutters. The set if a good way to start off if you're intimidated by the thought of making your own. However, they'll still need to be tuned up to work correctly. The hole cutter - I don't recommend using the hole cutter. It's awkward, heats up very quickly, doesn't cut very well and can make for some nasty catches. I set mine aside and haven't used it since. If you'd like to purchase mine, please contact me. The cutter holder - The holders need a little bit of tuning up prior to use (I strongly recommend having 4 of them to speed up the process of the 5 ball project). First, the bottom of the holder needs to be very flat to register against the tool rest snugly. Secure a cutter in the holder (any one will do) and flatten it with a piece of sandpaper on a plate of glass. I use a 120 grit wet/dry paper. Wet the glass, place the paper on the glass and wet the paper. Then hold the bottom of the holder firmly on the sand paper and stroke it back and forth a few times. Look at the bottom of the holder and you should see it quickly getting flat. Continue until you have an even pattern on the bottom of the holder. Next, the edges of the curved section where the holder registers against the ball, need to be relieved. Remove the cutter from the holder and place the holder in a vice. Get a 1" wide strip of 120 grit sand paper about 5" long. Holding the paper between your hands, stroke the paper against the curved section to softened the sharp edges. When the sharp edges are gone, soften the ends and corners also. The cutters - Mark your cutters 1 through 4. 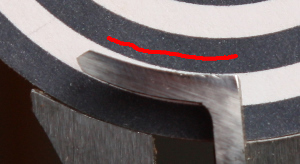 The #1 cutter reaches furthest into the ball and has the shortest radius and shortest cutting length. White out makes a effective ink. Starting with the #4 cutter, you need to flatten the top of the cutter (the portion facing upward when in use). Getting this portion of the cutter very smooth and polished allows you to get a sharp cutting edge. Flip the cutter upside down and use which ever method you'd like to get it polished and flat. I find the sandpaper on glass method fastest and easiest. I start with 120 grit and progress through 220, 320, 400, 600, 1000, 1500 and 2000. I end up with a very flat cutter with a mirror polished surface. It takes about 5 minutes per cutter. Now you can sharpen the primary cutting edge of the cutter. I leave a slight wire edge on the cutter much like a scraper. Some people prefer to shape the cutting edge into a point to make it easier to track into an adjacent chase and to reduce the likelihood of a catch (I find that even the slightest reduction in the likelihood of a catch is well worth the effort). You might as well learn now to sharpen the tip of the cutter while it's on the holder. The cutter will need to be sharpened about every 4 holes, so it's much easier to sharpen it while still in the holder. The cutter profile - With the #4 cutter in its holder, hold it up to the template. While normally used for adjusting the cutter in the holder right now you want to check the shape of the cutter against the template. The inner and outer edges of the cutter should exactly follow the lines of the template. If they don't, you'll need to shape them to fit. French turner, Christian Delhon has a very well engineered set of hollowing tools. He offers them in both 5 and 7 level ball sets designed for 65mm balls (just slightly larger than a 2-1/2" ball). His holder may be used with a wider tool rest and eliminates the need to adjust the depths of the cutters. The set is fairly expensive, but probably worth it. You can see the tools at his website.